Playa Tamarindo, with its gorgeous beaches and clear, blue water, is a jewel of Costa Rica. It has a relaxing atmosphere, with plenty of water-based activities and adventures to choose from. 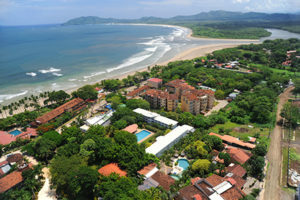 Tamarindo is a small town that started as a fishing village. It’s come a long way since then. Thanks to Costa Rica Dream Adventures, you can learn a bit about this amazing destination. Playa Tamarindo is a popular spot for tourism in the Guanacaste Province, on the northwestern border of Costa Rica. With pristine beaches and less humidity than the rest of Costa Rica, it was inevitable that this area would become a popular spot. It stretches for 3.5 km along the western coast of the Nicoya Peninsula. Playa Tamarindo (playa, meaning ‘beach’ or ‘seashore’) makes up most of the coast where Tamarindo is located. It is a colorful, and multicultural, town known for an enjoyment and celebration of life. Known for its tropical dry forest climate, there is less humidity than that the rest of Costa Rica; which makes this area one of the more comfortable places in Costa Rica – a refuge from the muggy rain forest of its neighbors. Tamarindo has many water-based activities to choose from. Some of these activities include: surfing, diving, snorkeling, ocean and river kayaking, wind surfing, sailing, and beach cruises. The playa is known as a mecca for surfers. The conditions for surfing and windsurfing are perfect for beginners, and the experienced alike. The warm waters of Tamarindo make for pleasant times in the water, pretty much year-round. And, with this many activities, you’ll want to immerse yourself as much as possible in the temperate waters. On the beautiful water of Tamarindo, sport fishing is also a common activity along the playa. Marlin, sailfish, giant tuna, and a few other species of fish have been caught at record sizes. The fishing grounds around Tamarindo are productive 12 months out of the year. Whatever your choice of fishing, shoreline or deep sea, there are eco-responsible captains to navigate you where you need to go. Only a short ride from Tamarindo, you can get to Las Baulas National Park, which contains the beaches where Giant Leatherback Turtles go to lay eggs. This is one of the few places on Earth that they choose to do so, and is a natural sight to behold. 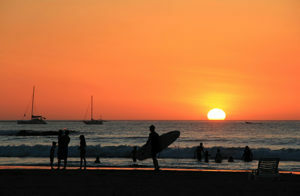 The area around, and just outside, Tamarindo has more activities than a single vacation could cover. Located just outside of Tamarindo, the Arenal Volcano National Park spans 29,692 acres and is home to a vast tropical forest. In the forests surrounding the area of the volcano, you will find capuchin monkeys, deer, and coati; as well as 850 species of identified birds. There are vast canopies of trees to zip-line through, from an elevation of 150 ft. up into the great trees of the forest. When you are done exploring the beach, hitting the waves, riding the zip-lines of towering tree, or relaxing by the pool; the food and dancing await those who wish to adventure further into the night. Whether you need a relaxing session on a beautiful beach, a family vacation, or an adventurous time in rain forests–Tamarindo is a great place. So, let Costa Rica Dream Adventures take you to paradise. Combination of rainforest adventure and beach relaxation. Families will start their adventure in the Arenal Volcano area and afterwards, they will enjoy the tropical beaches of Guanacaste at a beachfront All-inclusive hotel, perfect for families and couples! Located in one of the most beautiful corners of Costa Rica, Esplendor Hotel Tamarindo offers a space where natural beauty, adventure and elegance combine to perfection. Enjoy spectacular sunsets, Pacific views or a drink in an infinity pool. Perfect for couples! For the adventurous seekers, this program is filled with exciting activities and beautiful sceneries at two of the most visited locations in Costa Rica. This expedition will ensure family travelers a thrilling, fun and worry-free adventure of a lifetime!